Hundreds of residents of Gush Katif marked on Wednesday the sixth anniversary of their expulsion from their homes in a special ceremony. Hundreds of residents of Gush Katif marked on Wednesday the sixth anniversary of their expulsion from their homes, during the Sharon government’s 2005 disengagement plan from Gaza. The annual event marking the anniversary of the expulsion from Gush Katif took place, as it does each year, near the Kissufim crossing, which is the closest point to what was formerly the Jewish communities of Gush Katif. Vanunu said that today, 20% percent of the Gush Katif expellees, who had to move into temporary caravans after the expulsion, have moved into permanent homes. The event on Wednesday focused on the young generation, particularly on those who were small babies at the time of the expulsion and are now starting first grade. 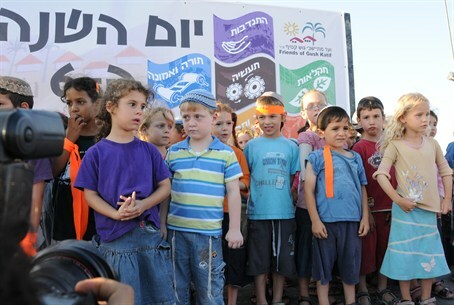 During the ceremony, children who were born in the year after the expulsion and did not really know Gush Katif, went up on stage and received a gift and a certificate stating that they have joined the Gush Katif family. The Rabbi of Gush Katif, Rabbi Yigal Kaminsky, said during the ceremony that the spirit of Gush Katif continues across the country today.